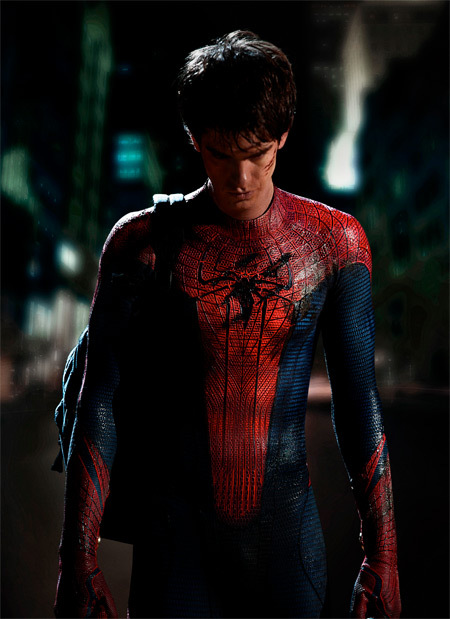 Here is your first look at Andrew Garfield in the new Spider-Man costume. Sam Raimi and his costume designer did a pretty perfect job with Tobey Maguire’s so I was interested to see what would change for the reboot. I feel like the first thing that sticks out for me is the texture of the suit. It almost reminds of the Green Lantern suit that’s all CGI. Next were the gloves. Not your traditional red gloves as seen in the comics and previous films. Almost a shredded look going up the arm. Also notice the blue coming in around the thumbs and back of the hand. Lastly, it seems Garfield did not bulk up too much for the role. Which I actually like since he is a high schooler. Enough about what I think. Tell us what you think in the comments below.